THE BEST HORROR FILMS EVER MADE! Once you've seen all these films, there's little else that the horror genre has to offer except for more repetition and inferior clones of the same. If you are new to the horror genre, just fill up your DVD/Blu-ray collection with these and throw any other "horror movies" that you may have acquired in the bin. You aren't going to watch any of them ever again anyway. Also note that a considerable number of these titles barely meet the minimum requirements for "horror"—mainly because they aren't SCARY—but I needed 200 of them for this list. 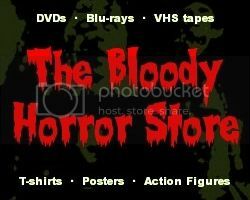 If you want to buy any of these films, you can save a small fortune by getting them from The Bloody Horror Store.